It may not have been swimming weather this year at the Baltic Cup in Liepaja, but the basketball was hot as the top Masters teams battled it out for the title of best team in the Baltics in their respective categories. The Lithuanians once again proved that basketball is a religion in their country taking out seven titles from the eleven categories this year, followed by the Latvians with four. The trip south proved unsuccessful on the court for the Estonians this year and was a learning experience for the Russians who joined us for the first time, but a great time was had by all under the watchful eye of the 3 person officiating. 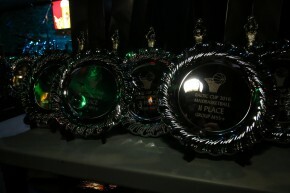 The MVP awards and the prizes for the best teams were presented at the awards ceremony on Saturday night at the “Vecais Vikings” Restaurant and Night Club, where the players showed that they still had some moves saved up for the dance floor. The second Baltic Cup tournament this year had 36 teams, growing from 21 last year, and is proving to be a popular event on the veterans basketball calendar. We hope to see you in Kaunas, Lithuania for this popular annual event in 2017.